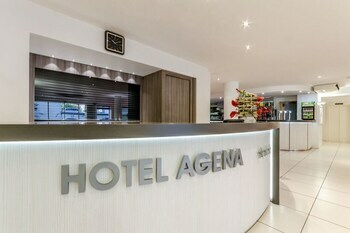 A stay at Hotel Agena places you in the heart of Lourdes, within a 10-minute walk of Rosary Basilica and Notre-Dame de l'Immaculee-Conception. Featured amenities include a 24-hour front desk, luggage storage, and a safe deposit box at the front desk. Self parking (subject to charges) is available onsite. With a stay at this vacation home in Laprade, you'll be within the vicinity of Abbey of Saint Benedict Calcat and Mazamet Tourism Office. Free self parking is available onsite. With a stay at Château de Thorens in Thorens-Glieres, you'll be on a river, and 12.8 mi (20.6 km) from Menthon Castle and 14 mi (22.5 km) from Annecy Castle. Free self parking is available onsite. When you stay at Vacancéole - Résidence Ar Peoc'h in Rochefort-en-Terre, you'll be 7 minutes by foot from Rochefort-en-Terre Chateau. Free self parking is available onsite. When you stay at this villa in Six-Fours-les-Plages, you'll be convenient to Le brusc. Free self parking is available onsite.